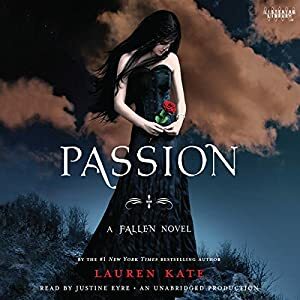 In a YA market that is focused so intently on vampires and their offspring, it was an incredible moment for the publishing industry when Lauren Kate brought out her first book, Fallen. This writer went on to engage millions of readers with the next book, Torment. Now, there’s Passion - with one book left to see the light of day titled, Rapture - which is due in 2012. With this blissful series, Lauren Kate has delivered time and time again with the best characters, the most extraordinary plotlines, and created one of the best series in the history of YA novels. For the few readers who have not yet jumped “on board” with Lauren Kate, this is a series of books that follows the life of Lucinda Price. Luce is a girl, like any normal girl, who was put into a school called Sword & Cross a while ago, and had a feeling that something wasn’t quite right about it all. Through her years, she has found out that she is surrounded by Fallen Angels - the group that fell from Heaven when they couldn’t decide which “side” they wanted to be on. These are the angels who didn’t really know whether to hold their loyalty to The Throne, or follow the “really bad angel” down below when he was tossed out of the Pearly Gates. There is an angel named Cam, who isn’t exactly a nice guy, as well as many others on both sides. Daniel is the one who makes Luce’s heart pound out of her chest. Why? Because Daniel and Luce have been together forever - literally - throughout time. Their love has survived in all different lives, yet the curse that they live with is the fact that each and every time they WILL be separated from each other. In other words, in every lifetime, Luce dies in the arms (wings) of Daniel, just to be reincarnated in another life to find him and try it all over again. In this new book, Luce is on a quest. She wants with everything she has to find out how and when the curse first started so she can go back and change the past…in order to actually have a future with Daniel by her side. Using passageways called, Announcers, Luce travels back to truly remarkable places in history. She finds herself with her grandmother in Moscow during WWII, and sees herself die in Daniel’s arms. She travels to Milan in WWI, when Luce was a nurse and Daniel was a wounded soldier. In England in 1854, in a Tudor-style mansion, Luce must “hide” from her former self by being a scullery maid, while watching her own soul fall in love with the live-in artist named Daniel, who she knows only as the angel of her dreams. From a shipwreck in Tahiti, to an old frightening Mayan ceremony, Luce sees each and every time where she died and was taken away from the one man she constantly loves. Reincarnated time and time again, Luce is literally “dying” to try and find a way in her past to stop the curse from happening, so that present-day Luce and Daniel can be together without worrying about her demise once again. While traveling back in time Daniel is right behind her, trying to stop Luce from perhaps making a mistake so big, that the past alters the future for good - making it so they can NEVER find each other again. Add in a strange little gargoyle that is following Luce around in every lifetime she visits, and this story becomes a monumental, powerful plot that everyone should be reading! With the ending in place, and Rapture coming out in 2012, Lauren Kate has proven, yet again, that she is one of the best - if not THE best - YA author out there. The underlying theme that you should love every moment of someone’s existence even if it ends in tragedy; or, that soul mates will constantly find each other in every life no matter what the obstacles - is truly inspiring, invigorating, and entertaining, all at the same time. Quill Says: The whole series is truly beyond Rapture. Book after book is a thrilling adventure that brings pure ecstasy to each and every reader!